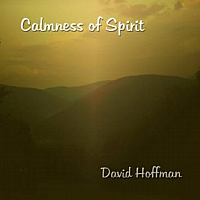 Calmness of Spirit by David Hoffman. David Hoffman is a brilliant composing musician from Illinois named a top award winner among others in The Tenth Annual Independent Music Awards. David was selected by a 62 member panel of industry professionals including popular artists Seal, Aimee Mann, Ozzy Osbourne, Arturo Sandoval and many other influential musicians. Many may already recognize David Hoffman by his lengthy tenure with another famous musician named Ray Charles, having been the trumpet and flugelhorn soloist, along with his presence as composer and arranger with the Ray Charles Orchestra. It was during his 13 year partnership with Ray Charles that David Hoffman extensively toured many notable venues in Europe, North and South America, Africa and Asia. Additional tours included Russia in 1994 and a return visit in 2000, where he performed with the Moscow Symphony Orchestra. Calmness of Spirit is a beautiful instrumental album merging New Age and Jazz in a remarkable coupling which gives the listener a distant ray of sunshine impression by the elevated melodic ambience and tonal qualities. What makes this CD album so unique is the transition in style by the artist himself, and needless to say, it is a successful one. David skillfully performs on piano and the trumpet, for which he is famous. Another great artist on this album is colleague Paul Adams who co-produced and performs Native American flute, guitar, percussion, and Hulusi wind instrument. David Hoffman is a masterful Jazz performer and expert brass musician making a fine transition by Calmness of Spirit. In addition to the more New Age and Jazz influence blending in Calmness of Spirit, David’s earlier more Jazz or World music centered albums are; From Energy to Stillness, Groovin’, The David Hoffman Sextet Live, and Christmas In Your Heart. David Hoffman also provides area located and online instructions to students of all levels from beginner to expert. As a Jazz great, his vast areas of expertise in composition, scoring and arranging on a multitude of instruments is unsurpassed. Visit the davidhoffmanjazz.com homepage and visit pauladams.org to sample / purchase, or at his Amazon.com page. Album Art courtesy David Hoffman.